UFC welterweight Darren Till is looking to have a big 2018 and he's sent out a warning to his rivals. 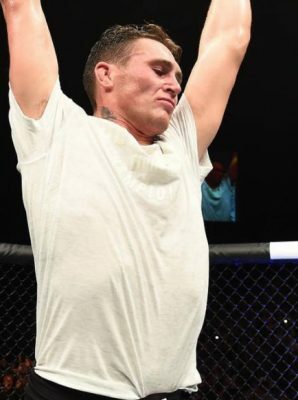 Darren Till is fast becoming one of the hottest commodities in the UFC welterweight division and in 2018, he’s looking to take things to a whole new level. The Liverpudlian has been the focus of many a callout since beating Donald Cerrone in Poland two months ago, but having cashed the biggest paycheck of his life, Till has been enjoying the fruits of his labour. With the new year now fast approaching, Till caught up MMANytt.com and gave an update on when we can expect to see him back in the UFC Octagon. “I wanted to fight before the end of the year, but my coach told me to have a break now and just enjoy and sit back having had a successful year,” Till said. “Obviously, Usman without a fight with Emil Meek and he was calling me out and if my coach would’ve let me, I would’ve had the fight, but I wasn’t really in the gym as much, with a fighting mind, so we can leave that fight until next year if he wants to fight me. That’s a fight I want. He obviously thinks the whole welterweight division is scared of him and he thinks he’s the best. He is really good grappler, I’ll give that to him, but that’s a fight I want to go in there and prove that I can knock him out in one round. “Next year, whether it be March or what in London, I’d like the UFC to just give me the hardest fights in the welterweight division. People say that I’m just striker, but if you see my come up against a grappler, you are going to see my grappling skills. I shrugged off Donald Cerrone’s takedowns off like were nothing. I’m pretty sure I’m going to do that with another high level grappler. I’m not scared of anyone. Anyone in the top-10 or anyone even outside of the top-10. When Till says he doesn’t really care who he fights, he really means it. As far as he’s concerned, the fight rumoured fight with Stephen “Wonderboy” Thompson would’ve been one he like, but now that’s off the table, there are plenty others that still appeal to him. “I did want the Wonderboy fight because I thought it would be an excellent matchup,” Till said. “With him being such a high level striker and myself thinking and knowing that I’m the best striker in the UFC, it would’ve been an exciting matchup in my hometown or wherever it might’ve been. It just would’ve been a great fight, but his Dad doesn’t think I deserve to fight him and Wonderboy says that he’s injured. That fight is not really there anymore. Till’s self-confidence shouldn’t ever be considered an act or a front he puts on for the media. Those that have know the man from Liverpool since he begun his fighting career will tell you that he’s always believed that he’s been destined for greatness. “They should be thinking about me as the dream fight because another one or two fights and I’m the name of MMA, I know that,” Till said. “That’s what is going to happen. Conor is off doing his own thing now. He’s not fighting anymore, what’s he doing? Who is there that believes in themselves enough and who has got enough skill. There’s no one else mate. No one has made as bigger leap as I’ve made just after one fight. People know, people see, and people believe. “After another one or two guys fall at my feet, I’m the guy in MMA and that’s the way it’s going to be. All these fighters can hate on me in the UFC, I can see them all tweeting about me sometimes hating on me, but I don’t give a f*** what you say, I just believe in myself. I got a goal, I just want to be a champion and I want to be the greatest fighter of all time so f***ing hate on that you pieces of s***. Till was more than happy to put the rest of the welterweight division in there place, but when it comes to the fans, he’s got nothing but total respect. He’s planning on having a massive 2018 and he wants the fans to join in on his path to the top. “Just believe in me, just believe in me as I believe in myself,” Till said. “If I’ve got fans out there, just believe that I’m the most humble people you can meet and that I’m just one of the lads from the street. Just believe in me as I believe in myself and we’re going to go far together.